HH Tunku Panglima of Johor, Tunku Abdul Rahman Al-Haj Ibni Sultan Ibrahim will make his debut as a motorcar racer at the 2019 Blancpain GT World Challenge Asia series from 6th – 7th April 2019 at the Sepang International Circuit. 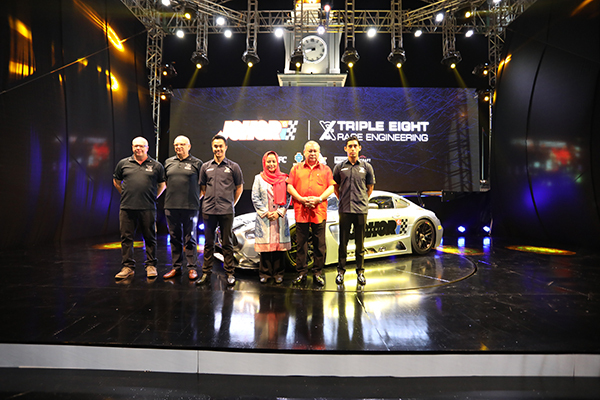 The Johor prince will race in a Mercedes Benz AMG GT3 for Johor Motorsports Racing, managed by Australian outfit Triple Eight Race Engineering. Partnering him will be fellow Johorean and Malaysian racing ace, Jazeman Jaafar. Tunku Abdul Rahman unveiled his team car, which depicts striking Johor livery on its side, at a ceremony attended by His Majesty Sultan Ibrahim Ibni Almarhum Sultan Iskandar and the rest of the royal family. “I am very excited and really looking forward to doing my best in this series. The support from my family has also been amazing,” said Tunku Abdul Rahman. “I am also very proud about this moment because my late grandfather, Almarhum Sultan Iskandar, was an avid racer too, winning the 1960 Johor GP, also in a Mercedes,” added Tunku Abdul Rahman. He said it also felt good to be racing for Triple Eight – the most successful racing team in Australia – with fellow Johorean, Jazeman, alongside him. The Johorean pair will be joined by experienced European Blancpain GT champion, Shane van Gisbergen. The 2019 Blancpain GT World Challenge Asia is an auto racing series for GT3-spec and GT4-spec cars. The season will be run over six race weekends consisting of two, one-hour races each. The first four rounds will start with Sepang from 6th – 7th April. Pre-season testing will also take place in Sepang in the days leading up to the race weekend. The series will then move to Buriram in Thailand (11th-12th May), Suzuka in Japan (22nd – 23rd June) and Fuji also in Japan (6th-7th July). The Man behind the Defender of the “LEGO” Universe!